Sometimes the obvious is the truest: parking lifts instantly increase the parking capacity of your business. If you operate a parking lot or municipal garage, the importance of this is a no-brainer. Especially in urban areas across America, parking spaces are at a premium. Lots that offer hourly/daily parking rates generate terrific business, and any one-off cost of a double or triple-wide lift will pay for itself handily in the first day or so, depending on the parking demand of your area. If you’re serious about getting more business to your lots, there’s no reason to put off a platform parking lift. Since there are no columns between platforms, each lift structure takes up as little space as possible, maximizing your parking potential. Because each lift platform rises 85” (7’), there’s plenty of room for most light trucks and SUVs. If your lifts are outdoors or in a building with high ceilings, virtually any high-clearance vehicle up to 6,000 lbs. can be raised without worrying about overhead clearance. Indoors, the lift platform’s rise is usually enough for vehicles, even ones over 6,000 lbs., to fit in the bottom row. The PL-6K series’ ability to accommodate this many vehicle types make is a formidable and competitive addition to your lots. Of course, you don’t have to run a public parking lot to find use from a commercial parking lift. Auto service bays and custom shops that need a way to safely store their clients’ property will enjoy the ability to stack vehicles. Many shops have limited parking space, which means turning away customers who drop in or request appointments when space is full. Parking lifts let you handle that overflow more smoothly; the increased productivity will quickly increase your bottom line. 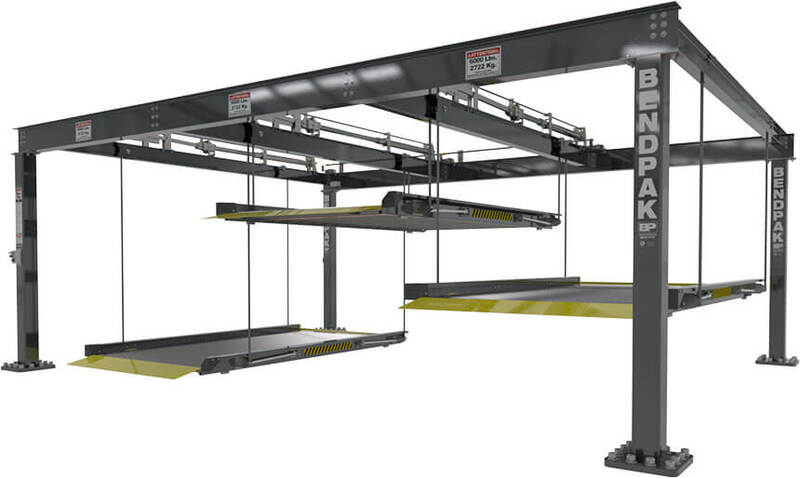 Most double or triple-wide parking lifts feature a single lift platform that holds two or three decks. The entire mechanism moves up and down together, so all cars stowed below have to be removed, even if you only want to move one vehicle off the top row. That adds up to a lot of work over time, even if multiple people are working to shuffle the vehicles. Saving a few minutes every time you move vehicles off the top row adds up to hours over time, and as the saying goes, time is money. Our job is to make you as competitive as possible in your business. It’s not enough to provide the storage. We want to make vehicle swaps on and off our parking lifts as seamless as possible. If two companies offer the same service at the same price, and all things appear equal, how do customers choose who they give their business to? The most likely answer is the business that behaves and looks to be the most professional. BendPak doesn’t make “hobby” lifts. We always aim to design the most rugged, durable and fully certified parking lifts on the market. Along with our sleek, modern Gunmetal Gray powder-coat finish, our internally routed aircraft-quality cables and hidden hydraulic cylinders (one cylinder per platform) look and behave professionally, as advertised. That means you, your customers and even passers-by will be impressed by the quality of your lifts. As proof of our professional success and reputation, BendPak car lifts are featured on many car shows on Discovery Channel® and Velocity®, among other stations. We’re the trusted name that speaks confidence and smarts when it comes to building up the reputation of your shop or business. If you want to achieve acclaim in your work, a PL-6K parking lift is a good place to start.